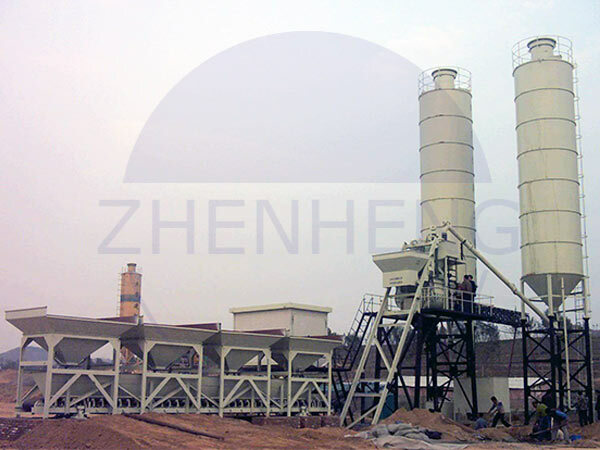 HZS concrete mixing station running -6 big notice-Zhengzhou Zhenheng Construction Equipment Co., Ltd.
A. The operator should concentrate, to observe the batching machine is normal. Concrete mix water supply is appropriate, Mixing machine is working properly. B. When Cleaning materials pit must turn the machine off.shut off the main power supply, insert safety plug of the hopper. C. If there is aggregate paste on the bottom of the batching machine,or there is adhesive material in the hopper, Should promptly shut down power and remove them,to avoid mixture ratio mistake. D. When the machine is working,it cannot be repaired.When it’s mixing,cannot be stopped.If something happens, Open the discharge door immediately and shut down the power, out-load materials by workers.After cleaning the fault, turn the machine on again. E. The machine shall not overload . F. When the machine stops running,you should open the flush switch to start pump, Clean inside and outside the mixing tank,discharge hopper,scale hopper,cut off the power supply,clean-up the construction site. Fill the machinery relieve record seriously. Previous:Six major precautions for concrete mixing station winter maintenance - do you know?